Overture Plano is a 55+ apartment home community in Plano, Texas. With 169 apartment homes for rent, the age-restricted community presents a maintenance-free option for active adults who desire an alternative to single-family homes or senior housing. The friendly community consists of updated apartment homes, entertaining amenities, and unique lifestyle offerings, all in a central location surrounded by the daily conveniences of stores, restaurants, and recreations. Whether residents want to relax by the pool or take a trip to Dallas just 30 minutes away, Overture Plano puts them in the ideal place to enjoy it all. Overture Plano goes above and beyond to provide amenities for its residents in order to create a luxurious rental environment. The community developed 16,000 square feet of resort-style amenity space that makes days at Overture Plano feel like a vacation. The community presents residents with three diverse dining opportunities. Hungry residents can visit the bistro cafe for a quick meal, savor a sit-down dinner in the large dining area, or even convene a special dinner in the private dining room. The large dining area converts into a meeting space roomy enough for the community's most popular events. A demonstration kitchen teaches residents how to cook new cuisines. Residents can chat and meet for activities in the game room and theater. And, there's no need to leave the community for a spa-like experience with an on-site hair salon and nail salon. A fitness center and yoga studio offer a variety of regular classes so residents can stay physically active. Outdoors, the amenities continue with a swimming pool, lounge courtyard, and walking trails. A weather-protected porte-cochere, or covered outdoor area, let residents stay outside even when the weather disagrees. The apartment area is also complete with elevators and air-conditioned corridors to so you can walk around the community in comfort. Overture Plano features 169 apartment homes that range between 553 and 1,548 square feet. The studio, one-bedroom, and two-bedroom residences have wood-style plank flooring, large windows, and heating and air conditioning controlled by each individual unit. Desirable features in the kitchens include granite countertops, glass-tiled backsplashes, black appliances, and under cabinet lighting. Plush carpeting can be found in the bedrooms, while the bathrooms include walk-in tiled showers. Additional amenities found in each residence include a full-size top load washer and dryer as well as private balconies and patios for sought-after outdoor living. Storage space is also offered. Residents at Overture Plano can take part in a variety of activities with friendly neighbors. 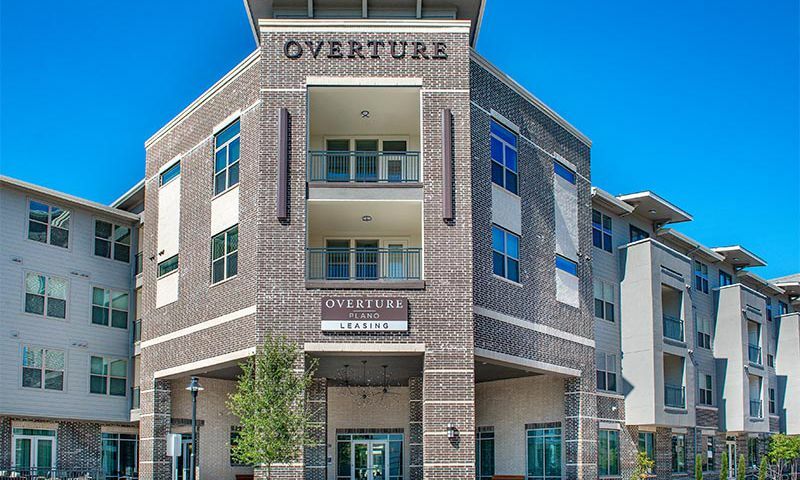 With social hours for residents and “yappy hours” for residents and their pets, an active social life is encouraged by all aspects of life at Overture Plano. Exercise classes such as Wii fitness training, water aerobics, Tai Chi, and Zumba help maintain physical fitness. Cooking classes function as a great way to prepare to participate in the regular potluck dinners. Movie nights, game nights, holiday parties, crafting events, and book clubs pop up throughout the year so there's always something to look forward to on the social calendar. Day trips to nearby areas or sporting events, all organized by the community, allow neighbors to travel together. Many residents want to continue their education, so the community offers safety seminars, wellness education, and nutritional guidance so residents can always learn something new. Additional classes that teach new skills and hobbies include software, computers, history, ancestry, and writing. Overture Plano is located in Plano, Texas close to the intersection of President George Bush Turnpike and Highway 75, surrounded by outdoor entertainment options, shops, and restaurants. It’s also easy to use public transit to get where you need to be, but the community also partners with Lyft to help residents travel. When residents want to visit the nearest city, they’re just 30 minutes from Dallas. There are many grocery stories and malls just down the road, including Sam's Club, Central Market, and Walgreens. The food options close by include HEB Central Market Cafe, Maggiano’s Little Italy, Rosa’s Cafe, and Cafe Brazil. Residents will also find a U.S. Postal Service and several local and national banks nearby. Those looking to get out for some nighttime fun can head to Studio Movie Grill for dinner and a movie. Meanwhile, golfers will appreciate the proximity to Los Rios Golf Course, Canyon Creek Country Club, and Preston Trail Golf Club. The community is less than one mile from The Medical Center of Plano and just a quick drive to Texas Health Physicians Group, which represent just two health care options. The Plano location puts residents very close to Dallas, Fort Worth, and Arlington as well as all of the activities and entertainment available in both. Vacations are a breeze with Dallas/Fort Worth International Airport just 25 miles west. There are plenty of activities available in Overture Plano. Here is a sample of some of the clubs, activities and classes offered here. Overture Plano consists of 169 apartment homes that range between 553 and 1,548 square feet. These studio, one-bedroom, and two-bedroom residences feature wood-style plank flooring, large windows, and individually controlled heating and air conditioning. Want to learn more about Overture Plano?